Triple layers of fun wrapped up in turquoise and black. Zebra Lovers have found their heaven with this bow. The bottom layer is a turquoise 2.25" grosgrain ribbon, then a 1.5" black grosgrain, topped with a 7/8" zebra print grosgrain on top. There is 120" of ribbon wrapped up in the bow and it is attached to a French clip. 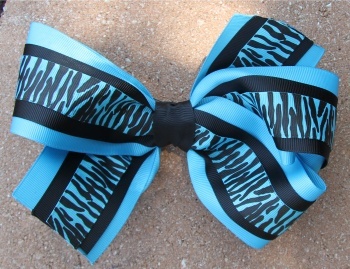 Any bow lover will love to add this to their collection.